For Release -07-20-14 - New York, N.Y. – (Release from www.Skullman.com) The inspiring documentary film about the 1992 Lithuanian Basketball Team, The Other Dream Team hit the big screen in 2012. 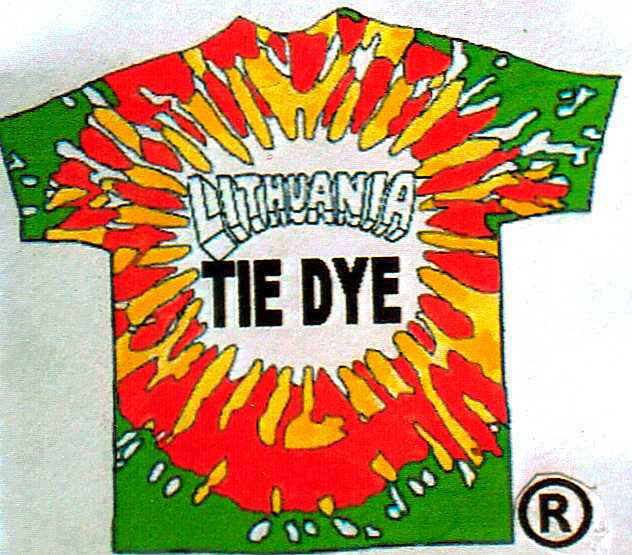 But few know the real story behind the infamous tie dyed uniforms worn by the team on the Bronze Medal Podium in the 1992 Barcelona Olympics depicted in the film. 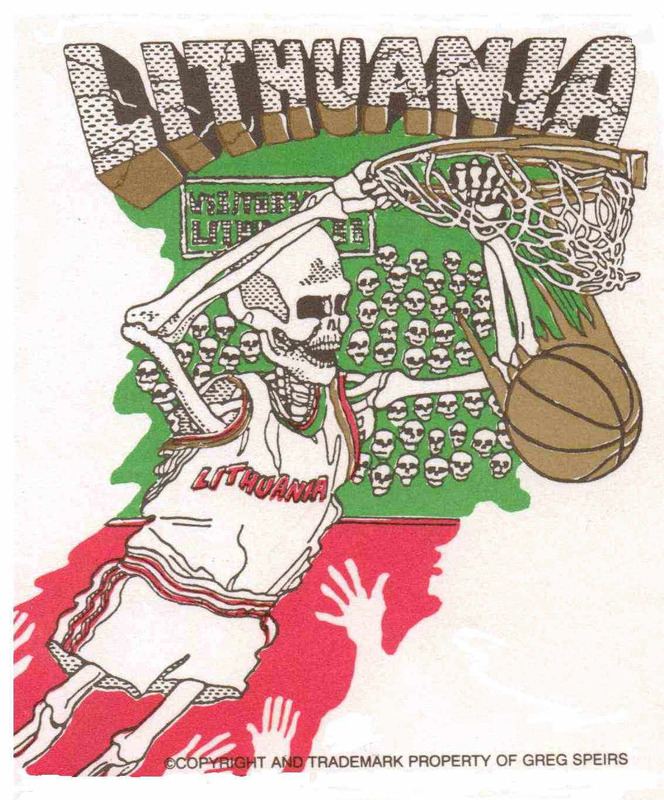 When the Lithuanian Olympic Basketball team wore NY artist Greg Speirs’ iconic design, it became a worldwide story and the Original Lithuanian Slam Dunking Skeleton became a historic symbol of Lithuania Basketball and part of the country of Lithuania’s new history. When the story broke the facts behind the artist’s creation were mischaracterized and credit for his major financial donation to the team was omitted from the story. The image came into this story independently from a New York artist and not from the rock group as had been reported. The fact is that the skeleton that you saw on the tie-dyed warm-up uniforms at the 1992 Olympics and on the tie-dye uniforms in the movie was created by New York artist Greg Speirs. According to the artist who created it, the design was not created as the icon of a rock group as had been misreported previously in the news. Speirs first major contribution of 100% of his profits ($450,000. ), was given to the team and far eclipsed all donations of others, was also omitted from the story. In the film you will see the artist describe his inspiration for the infamous skeletal image which has come to represent the spirit of the team and used to promote the film's run in theaters across the U.S. The fact is that the image was an independent creation that came from the artist and was not an icon of a musical group. Reporters were handed a prewritten storyline at the time and ran with it. As a consequence the story was misreported and is still being skewed today. After being informed of the facts many outlets chose to continue with the false narrative over the truth. The artist also acquired the status as the major sponsor of the team when he turned down all money generated from sales of his creation, and instead let it all (100%) go to the team and Lithuanian charities. The donation eclipsed all of the funding by the big names involved. An effort was made to downplay his part and keep this fact out of stories and was not reported. As the shirts continued selling news reports boasted that marketing of the shirts raised millions more that were given to charities and the team. This was all done using his trademark Slam Dunking Skeleton on merchandise like shirts. This second wave funded the 1996 Team, Lithuanian Children's Charities and helped build the basketball school in Lithuania. Again reports failed to credit the artist although these donations ultimately came from him as the owner and creator of the image. The original shirts are available through Skullman.com. Go to www.skullman.com for more info. This year the Skullman motif is available on designer cell phone covers for I-Phone and Galaxy.